To understand neurodegenerative diseases is one of the major challenges of the 21st century. The United Nations estimate that the number of people suffering from age-related neurodegeneration, particularly Alzheimer’s disease (AD), will exponentially increase from 25.5 million in 2000 to an estimated 114 million in 2050. The risk of AD grows exponentially with age, doubling approximately every 5 to 6 years. The largest increase in absolute numbers of old persons will occur in developing countries; it almost triples from 249 mio. in 2000 to an estimated 690 mio. in 2030. The developing regions` share of the worldwide aging population will increase from 59 to 71%. Hence, the global trend in the phenomenon of population aging has dramatic consequences for public health, healthcare financing and delivery systems in the world. The multifactorial pathology of AD makes it difficult to develop feasible therapies and current approved drugs attenuate symptoms but do not cure the disease. Research into AD has also had several failures in terms of developing disease-modifying therapies. Since AD starts many years far before first symptoms occur, new scientific approaches therefore focus on early stage, which are discussed to be important in aging and the onset of AD. In this sense, there is growing interest in dietary patterns, stimulation of the brain, and physical activity as potential modifiable risk factors. 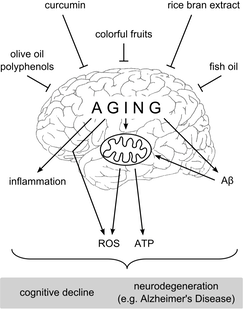 The planned preclinical study will provide new insights into the concept of healthy brain aging for the prevention of AD and early pharmacological intervention. Our reserach may lead to the development of evidence based new strategies to combat AD. In contrast to other tissues of the human body regeneration of cells in the central nervous system is limited. Although, neurogenesis from stem cells occurs in certain brain areas, the majority of neurons within the brain could not be replaced. Like in other differentiated tissues, cells in the central nervous system are affected by aging and react to aging, as indicated by a decline of several physiological abilities including sensory, motor, and cognitive functions. Aging cells are affected by increasing amounts of oxidative stress, perturbed energy homeostasis, accumulation of damaged proteins and lesions in their nucleic acids on the molecular level and by impaired function of signaling mechanisms and altered gene expression at the cellular level. These changes are significantly amplified in neurodegenerative disorders. Parkinson, Alzheimer but also oncological brain diseases, like glioblastoma multiforme, are clearly related to aging.